Chris J.M. Verhoeven was born in the Hague, the Netherlands, on February 25, 1959. He received the M.Sc. degree in electrical engineering from the Delft University of Technology in 1985. In 1985 he joined the Electronics Research Laboratory of the same department in order to prepare a Ph.D. dissertation on “first order oscillators”. He received the doctoral degree in 1990. At present he is an associate professor at the Electronics Research Lab. 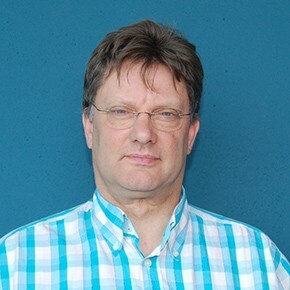 He is the project leader of the group “Structured Electronic Design”, in which design methodology for synthesis of analog basic circuits is addressed. To date the main topics are wide band amplifiers, bandgap references and oscillators, with an accent on low power and low voltage circuits for RF, and also optimal application of technology. The topics in this field are the application of SiGe technology in exponential low-power RF-circuits and application of Single Electron Tunnelling technology for implementation of efficient neural devices.